We spent our last night in Africa in Nairobi at the same hotel where we started â€“ the Fairmont Norfolk. It was nice to get back into civilization again with a working wifi system, a TV, and a lovely place to have dinner. We retrieved our luggage containing our city clothes that we had stored there, and immediately sent a big load to be washed. The highlight of our stay in Nairobi, and probably one of the main highlights of our whole African trip, was meeting a young Nairobi man, Pascal, for breakfast the next morning. I had heard about him through my friend and writing instructor, Ellen Bass, and our tour director, Anastasiaâ€™s Africa, helped arrange the meeting. 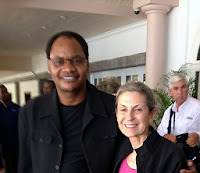 My husband Bob and I spent an hour with him talking about the Kenyan orphan situation â€“ out of 30 million people in Kenya, 1.3 million are orphans caused by HIV/AIDS and cancer deaths of the parents â€“ the economy, the Chinese poaching, and the corruption in the Kenyan government. After breakfast we walked into Nairobiâ€™s already crowded and hot business district near the hotel as the shops were just beginning to open.Pascal and I also exchanged information about our writing lives. Heâ€™s been writing since boyhood, and he recently had some short stories and poems published. One won a prize, which appears below. Because of his brotherâ€™s suicide death ten years ago he has been writing to heal â€“ a subject near and dear to my heart. It always amazes me that no matter where I go or whom I speak with, I find they have or know someone who has suffered a similar loss as mine. Now Iâ€™m happy to say Pascal and I are sharing our writing and continuing our conversation through email. Pascal is the CEO of G.R.A.C.E. Grassroots Alliance for Community Education., a not-for-profit organization that provides programs in early childhood development, orphans and vulnerable children (OVC) education sponsorship, agricultural development at its ten-acre farm in the Nanyuki district in the Mt. Kenya region, legal and social justice, and technical and financial assistance to their grassroots partners. When I first found out about this organization through Ellen about a year ago, I gave a little donation. Please join me. Here are some its donor partners in the United States. From Gaddafi to the rebels……or is it NATO? Weighed down by the impossible food and fuel prices. And the windâ€¦O what happened to the wind? in the rolling 60’s and coup-infested 70s and 80s? The AK 47 with twitter? Dying of state-induced idleness and self pity….. While slums mushroom in every open space…. Brother â€“ what happened to the land we fought for? Leaving us cramped in Kibera, Soweto, Kawempe and Kechene? Soon after our meeting with Pascal, our tour company arrived with two vans to take us to the airport. One to carry our luggage and the other to carry the four of us. While our travel mates went directly to Paris, Bob and I stopped fo r about twenty-four hours in Dubai before going Â on to Paris for the last four days of our trip. 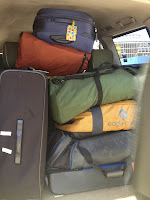 What we all call the nadir of our trip was waiting for our flights out of Nairobi in the so-called business class lounge â€“ hot, uncomfortable tents with porta-potties next door. It looked like the Nairobi airport still had a way to go to recover from its recent fire. But I donâ€™t want to end my tale of our African trip on a sour note. Again, I have to say it was a trip of a lifetime. I recommend it to everyone whether adventuresome or not. The people, animals, birds, and landscapes are breathtaking. One of these days Iâ€™m going to put out a picture book that will show you what I mean. Madeline, This has been a fascinating series as you have offered a colorful glimpse into Africa and its people. I can see where it was a trip of a lifetime and I’ll bet you will have a cartload of stories to tell for a long time to come. Thank you for sharing your journey in so much detail. The photos are stunning and that picture book sounds like a fabulous idea! I always love your encouragement. Glad you liked the series. That’s what I love about travel;the people we meet and the realization that we are all the same deep inside. There are writers all over the world, and I have a desire to meet and interview people from different parts of the world. That’s what fuels my passion for life. Yes, Sonia, travel is wonderful for that. Although the animals were a huge attraction, my interactions with the people at the camps, the guides, the natives that we met along the way, made for a much richer and everlasting experience – actually life changing.